Bill Luckey owns a wean-to-finish operation in Columbus, Nebraska where he also holds partial ownership of a sow farm. Bill is responsible for the daily care of 740 nursery pigs and 1,400 finisher pigs. In addition, his family operates a 2,000 head custom contract finisher. They market 10,000 pigs annually. Bill also raises corn, soybeans and cattle on 700 acres. 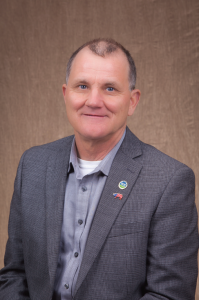 Bill is currently serving on the board of directors for the Swine Health Information Center. He has also been active on numerous National Pork Board committees and currently serves as chairman of the International Marketing Committee. In addition, has given over 50 speeches as an Operation Main Street 2.0 speaker. Previously, Bill served on the National Pork Producers Council board of directors from 2008-2014 and on the Nebraska Pork Producers Association board of directors from 2001-2007 where he was president from 2006-2007. The main goal of the Checkoff is to provide information. This means both education to producers as well as to consumers. In 1999, I was selected to be a member of the Nebraska LEAD program. The mission of this program is “to prepare and motivate men and women in agriculture for more effective leadership.” I enjoyed and learned a lot from that program and being on the leadership teams on the local, state and even on the national level. I feel I can learn more being on this board, but I also think I can contribute to this board from my past experience in other organizations and my experience in the pork industry.